We are introduced to Dr Louise Banks (Amy Adams) via a montage of her nurturing her infant daughter, then caring for her through a terminal illness at a heartbreakingly young age. In the present, she’s called upon to play an instrumental part in an unfolding global emergency. Twelve gigantic objects (‘shells’) have appeared, without warning, hovering above random locations across the planet. A renowned linguistics professor, Banks is asked to head up the communications team. It’s the toughest job of all. Translating a truly extra-terrestrial language. Naturally, the military are on high alert to retaliate (or, preferably, strike first) at the very first inkling of peril. Rather than the Russian threat implied by those aforementioned cold war chillers, it’s the Chinese, current go-to movie villains, who have the itchiest trigger fingers. For now, though, Banks and her team, including sympathetic astrophysicist Jeremy Renner, tentatively enter one of the ‘ships’ with a more passive approach to that tried and tested sci-fi trope… first contact. A down-to-earth (ahem), unembellished tone contributes to a beautifully eerie atmosphere. The gorgeously long tracking shot that finally reveals the magnitude of the spacecraft sees Chinooks swirling all around while Jóhann Jóhannsson’s ominous, minimal score characterises the otherworldly presence of these colossal discs suspended mere metres from the ground. Their verticality is a neat subversion of the expected, one of many original details that help to create a refreshing spookiness. Long drawn out bass blasts infer primeval communication, alarm, and recall the 16rpm score that grounded the spiralling subconscious layers of Christopher Nolan’s Inception (2010). His influence is tangible. To such a degree it feels like one of the first ‘post-Nolan’ films, consolidating his impact on both darkening, and raising the IQ of, the mainstream blockbuster. Another influence, the most elephantine-in-the-room perhaps, is acknowledged up-front by the poster. Whether it’s Adams or Renner’s face staring out in wonder, the image echoes the iconic finale of 2001: A Space Odyssey (1968), Keir Dullea forced to confront infinity head on. The viewer can only wonder what awe this film’s leads are witness to nearly a half-century later. A military stand-off with aliens, the risk of global destruction to prove humanity’s superior might, meanwhile one lone maverick knows the truth… It’s one of cinema’s most clichéd set-ups. And yet it all feels fresh and progressive, emblemised by a female lead subverting a traditionally macho arena. Banks ploughs on through the impossible task of trying to understand the strange circles the visitors seem to be trying to communicate with. As she does so, we begin to decipher the fact that language itself is the crux of this most elegant and eloquent psy-fi. I was introduced to the Sapir-Whorf theory in the course of my education. It proposes that language goes far deeper than just being the system by which we decode our thoughts. It states that words are the very building blocks of our thinking, that language IS thought. Adams’ reference to it is a mumbled, throwaway line. Yet this fascinating premise is indeed being used as the foundation for one of the most cerebrally satisfying film fictions I can remember. By the end we have come full circle, arriving ourselves at a most intriguing, Nolan-esque, mind-expanding conclusion. 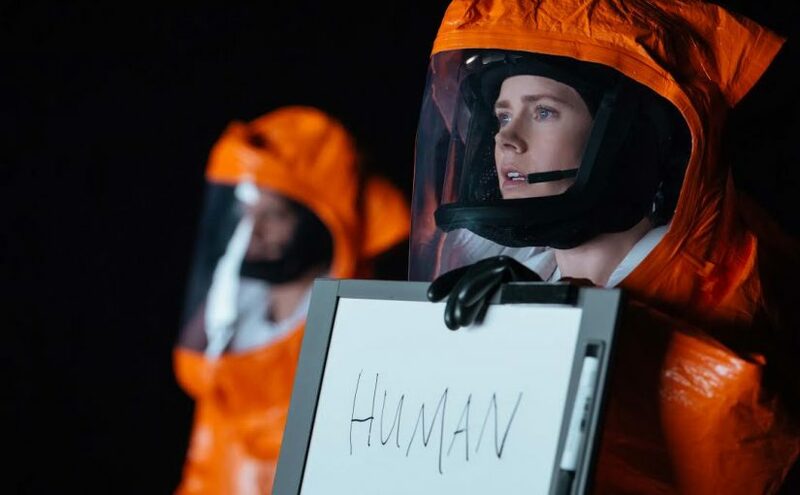 Like the very best sci-fi, Arrival leaves you pondering the biggest, most profound, yet ultimately earthbound concepts. Its immense and graceful structure hovers dangerously close to the surface of contemporary classic.